As well as continuing work on its bread-and-butter services like Search, Maps and Android, Google is always looking to expand with intriguing, innovative advancements. Project Ara is one, Project Glass another, and with self-driving cars also in the works, the Big G has just showcased Project Wing. A drone-powered courier service, Project Wing appears to be a competitor to Amazon’s Prime Air, and the aircraft itself is lightweight, completely unmanned, and considered a cross between a helicopter and a plane. It’s not only significant in terms of Google’s ecommerce credentials, but to those with a vested interest in aerospace, Project Wing boasts a very neat design. It takes off and lands in vertical fashion, as a helicopter would, but while in flight, glides much like an airplane. The Google X labs have come through with some pretty ingenious creations over the last few years, and Project Ara – the modular smartphone set to revolutionize the lower-end of the market when it launches early next year – is one of our favorites. But Project Wing offers a completely different take on the traditional courier, flying around automatically and when a recipient is located, gently lowering the package by means of a wire. 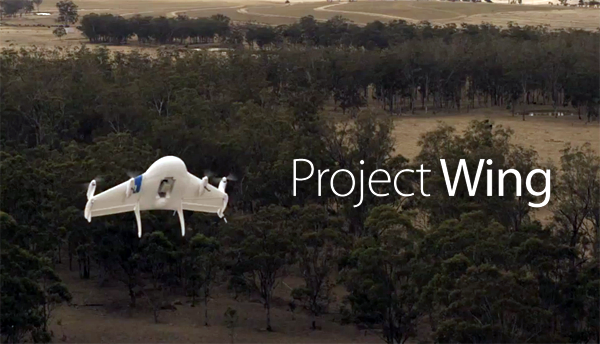 Given that, like Prime Air, it’s still very much in testing stage, it’s unlikely that your Nexus X is going to be arriving via one of Project Wing’s drones. In fact, we may still be a good few years from seeing this technology ubiquitously. However, with both Amazon and Google – two of the Web’s superpowers – already well into testing, the days of keeping a lookout for that UPS van may be numbered. The fact that Google has taken to the sky in this manner also highlights the fierceness of the competition between Amazon and Google these days. Amazon has been vying for spots on the search giant’s patch with moves into mobile devices, set-tops and all manner of tech, but while the retail company may have the jump on the Android maker in this new drone-based research, the previous work of Google X labs suggests that Project Wing will be right on its tail should said technology become mainstream. Check out the video of the project below, and be sure to leave your comments via the usual channels.